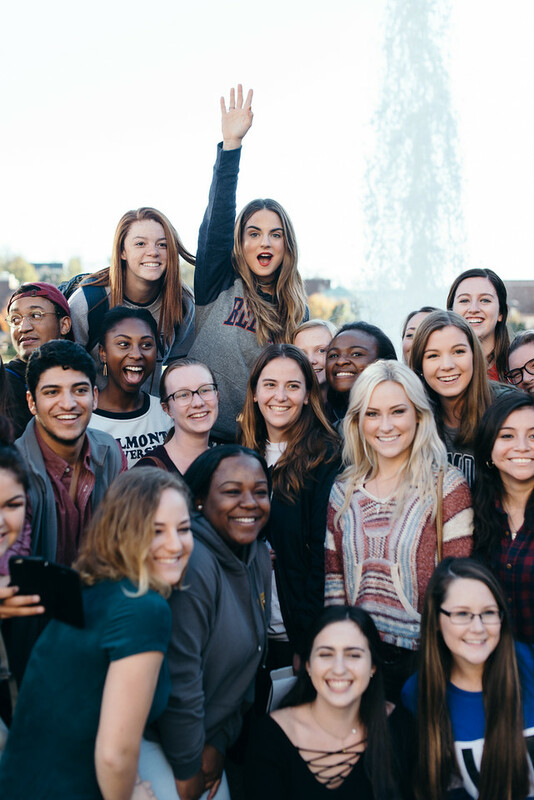 On Nov. 10, students welcomed pop singer JoJo to Belmont’s campus just like they do for every other freshman on his or her first day—by surrounding her car and cheering for her presence. 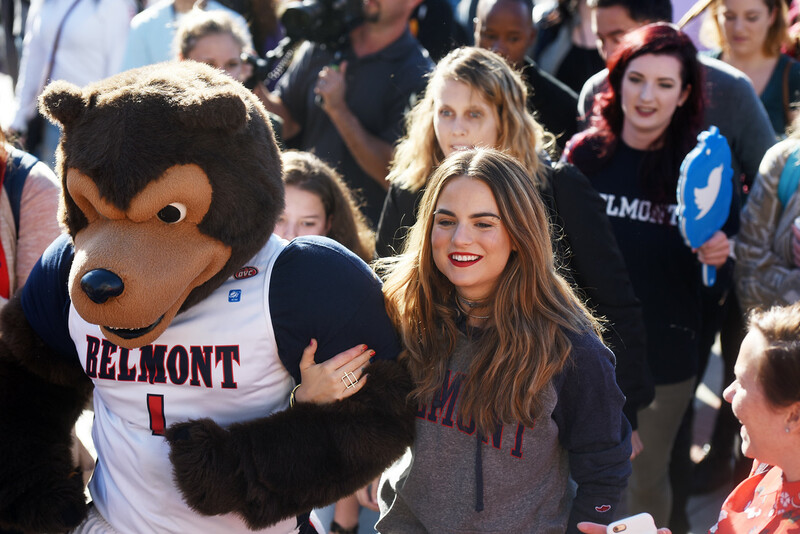 As soon as JoJo stepped foot on campus, she was embraced by Bruiser, Belmont’s mascot, and given a warm welcome by students, faculty and staff alike. After receiving an introduction by President Dr. Bob Fisher, she began her journey to being properly inducted as a Belmont student—attending an artist management class in the Curb College of Entertainment and Music Business, checking out the Robert E. Mulloy Studios in the basement of the Jack C. Massey Business Center, making a pit-stop to jam out in one of Belmont’s many gazebos and ending her day with a performance in the Massey Performing Arts Center. JoJo’s visit to campus was the result of an online voting competition held by Topsify, which is a tool used with Spotify to access Top 40 playlists in several countries. 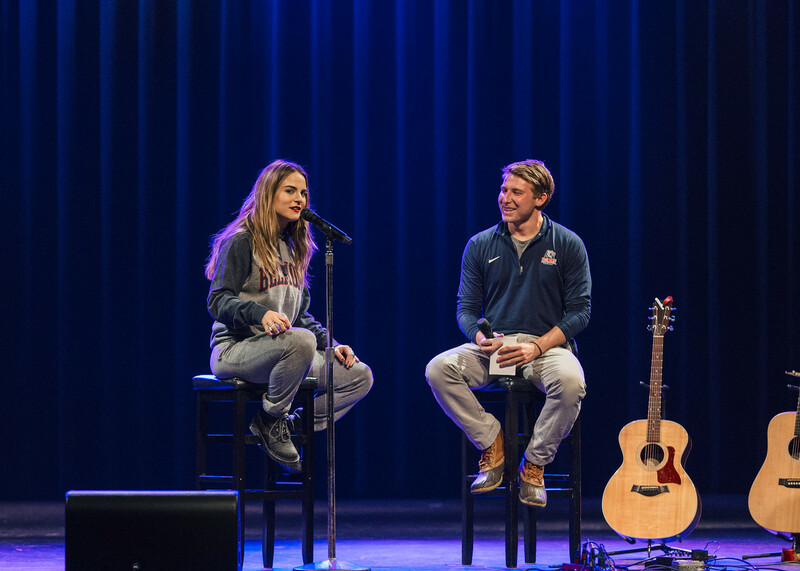 Students voted for JoJo to come to Belmont’s campus and be a “freshman for a day,” which included her presence in a class as well as a free performance and Q&A session. Belmont won the contest with over double the number of votes that the runner-up university received. 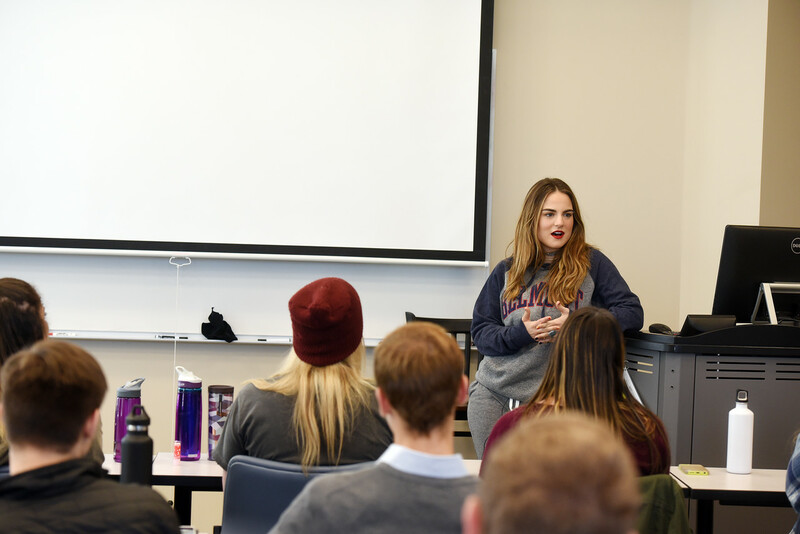 When JoJo began her day by walking into Instructor of Music Business Dwayne O’Brien’s artist management class, she walked into her first ever college class—and luckily, she had done her homework. Each student was assigned to give a presentation on an unsigned artist that they believed had the potential to be pitched to a record label, stating why they believed the artist would be successful. JoJo got up in front of the class and gave her presentation just like everyone else, discussing an artist named Michael Christmas from Boston, which is near her hometown of Foxborough. JoJo said, “The way that he moved an audience was the way that a star moves an audience.” While JoJo’s final presentation grade was never discussed, O’Brien did say that she had done a fine job. JoJo also listened in on several presentations and helped O’Brien give feedback to the students. After class was dismissed, JoJo made her way to the campus studios to surprise sophomore Gretchen MacIlwaine, who is a big JoJo fan and an aspiring musician. 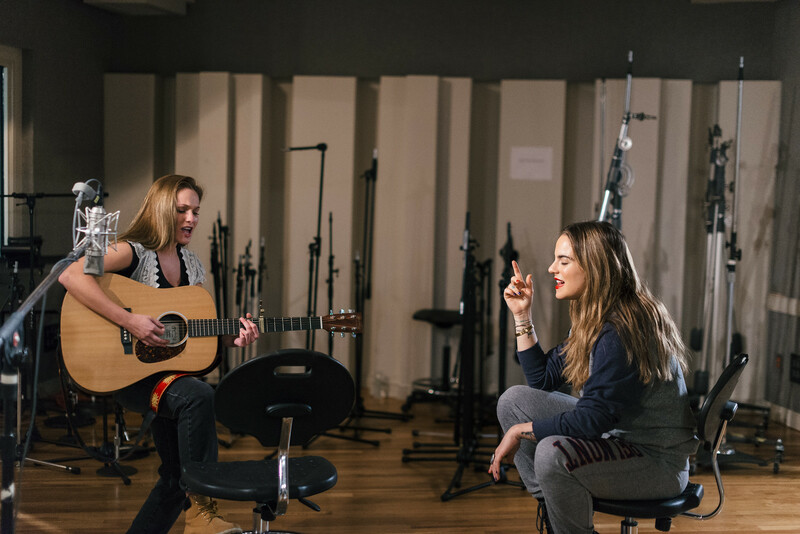 MacIlwaine was in the studio in the middle of a recording when JoJo walked into the room and gave her a big hug. The two then sang a song together, and JoJo invited her to sing with her later in the day at her scheduled performance. On the way to her dressing room to prepare for the 5:30 p.m. show, JoJo stopped in at a gazebo to sing a few tunes with musicians who were already rocking out and to take selfies with several of her many followers. 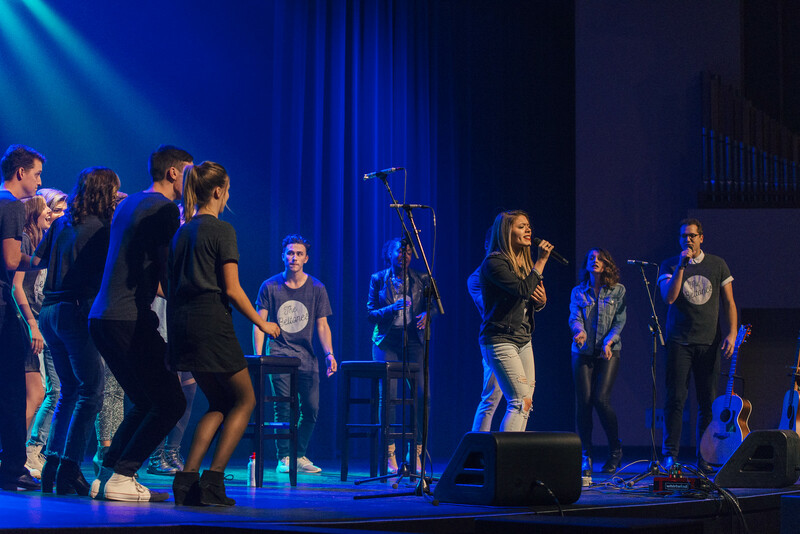 She then headed to sound check and, after a surprise performance by Belmont’s a cappella group The Beltones singing a medley of the artist’s hits, JoJo came to the stage and sang her new tunes “No Apologies,” “Clovers” and “I Am” to a packed room of students. Following the performance was a Q&A session hosted by Belmont senior Zach Middleton. Students were able to ask JoJo questions about the music industry and life in general, ranging from what advice she would give aspiring artists to what kinds of food she eats in the studio. JoJo ended her visit by thanking Belmont for hosting her and by saying how impressed she was with the student body. “I’ve heard so much talent in just the few hours I’ve been here, on both the business and creative side [of music]. It’s inspiring.” Although students couldn’t convince her to officially enroll at Belmont, they have a feeling she will always remember her first day as a college student. JoJo recently released her first LP in a decade called “Mad Love” and is currently finishing up the details of her next tour, scheduled to start in January 2017. To view photos from throughout JoJo’s “Freshman for a Day” experience, visit Belmont’s online photo gallery.